An Indie Film as Lucky Rare Bahamas Glimpse. The world of the movie Children of God is rich and varied. For a low budget indie film, the sets were sure numerous and varied. It's like they shot in a hundred different visually interesting locations. Note to indie directors: The Bahamas may be a good place to get a lot of good backgrounds for your buck. The one most important thing that the movie satisfied me with was complexly written characters, villians with motivation. Everyone had flaws, everyone (except for Purple and the first minister) had plenty to like and sympathize with, even though their situations were, without exception, "complex". The other thing that really satisfied me in Children of God were the themes of justice, unconditional love, honesty with yourself, honesty to those around you. The underlying issues are not gender or orientation but right and wrong but timeless issues. . I thought it was a great touch to include not one but two ministers with very different interpretations of how to be a good leader. The filmmaker was actually there for a Q+A (I love New York!) and I felt sorry that the audience discussion never got to the point of picking apart the very well balanced and thought out story. Meg brought me to the movie because she has friends in the Bahamas but I was really glad, because the carefully constructed story, the arc of events, and the depth of the characters has given me a lot to think about, both from a movie making standpoint and as a study of human nature. I liked that one very weak character proved by his integrity to be the superior character. Actually this happened more than once. It was definitely true of Jonny but also of the second minister and Jonny's dad, a bit. In the other direction, we see one character, the minister's wife, about to transcend the ignorance and lameness of her stance only to relapse with a vengence. The weak aspect of the film is the details of the dialog. The writer does not have an ear for the flow of naturalistic conversation. The actors should have helped out by saying "we should say it like this, it would sound better". I tried to raise this point at the Q+A but I didn't press the issue. Quentin Terrantino this dialog was not. o ephemeral lines weightless when first sketched on paper but ultimately realized in tons of rolled iron plate, reeking of the foundry. o the honesty of visible seams, both welded and bolted. Boxoffice is kind of a sibling to Calder's The Baron, a sculpture outside my first chemistry department in DeKalb's Northern Illinois University. There's a photo of the artist with Boxoffice here. A Newark blogger encountered this sculpture and took many photos of the entire surrounding plaza here. And there's an odd blog I found while looking for Calder connections here. If I Pull Your Leash Will You Tell Me Your Weight? A big dead bear? No! It's just sleeping off a dart in the service of Example 16, Chapter 9. Rolin Graphics (the illustrators), Thomson, Brooks-Cole (the publishers), and most of all Raymond Serway and John W Jewett (the authors ) are to be loudly thanked for making Physics for Scientists and Engineers a college physics textbook that is "Good enough to take to the bathroom" (thanks Kevin W.). Physics for Scientists and Engineers has already replaced the 2008 Regents Earth Science reference table for light reading in that part of my house. The text of the polar bear story problem reads "Suppose you tranquilize a polar bear on a smooth glacier as part of a research effort. How might you estimate the bear's mass using a measuring tape, a rope, and knowledge of your own mass?" I've nerded out on this book before. I went to my most intimate performance of the year, a play near Times Square. The theater was called The Tank five rows of seats, 20 seats wide -- and was packed on a Tuesday night. It was a new play called Magnitude of the Slope and it reminded me a little of a Richard Russo novel crossed with the movie The Usual Suspects. There were funny jokes in the first twenty minutes but it was still the time when the audience hadn't begun to believe in the performance yet and so everyone had their thinking caps on which means that noone yucked when, for example, the character started improvising a song about finding a package of condoms under the bed. Later in the play the audience loosened up and laughed at lots of parts. The female lead made her part funny by her body language. 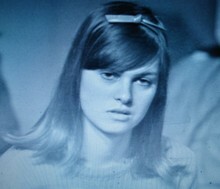 She had better physical acting than the male lead. He was great with the script though -- I liked his acting. Although he made the character not quite likeable -- possibly intentionally. There was lots to be sympathetic with the characters about. The guy character does embarrassing guy things, starting with laying a really corny, sad picnic at a Hawaiian Themed hotel room. The girl had just gotten off of work and was having a hard time reacting appreciatively to his Aloha Surprise. I liked that the play had a specific time: the day of Michael Jackson's funeral. Early in the play a mysterious prop appears, an envelope, that makes the eyes bug out on one character after another, although we the audience are never told what it is. I like that kind of joke played on the audience -- an unknowable plot element. After the play, small theaters being what they are, someone in my row actually went up and grabbed the prop and tore it open. I can't even, remember what was in it. Is there a word for an unexplained prop? Mystery MacGuffin? Magnitude of the Slope is reviewed (briefly) by NYTheater here. In the midst of the normal routine of sort-of-cool if you squint shows at Celebrate Brooklyn tonight's show was an authentic, can't stop yourself from jumping up and down, sort of gig. 1) The aisles of the pavillion were packed with standing people, violating the usual decorum that keeps standing people out on the lawn. Fans couldn't help themselves. 2) The concession stand was dead. "Yeah, this is kind of a first." a casher said. " Usually during any set, there's a steady rotation of traffic for beer and food." Deerhoof really has something for everyone. The foundation is Gang of Four guitars and Primus eggheadtechnical bass. The drummer is super spaz, flailing like a thresher trying to beat sundown. Visually, it's a backdrop of three beanpole looking Berklee School of Music guys with bad posture, holding forth like a slacker Mt Rushmore behind a four-foot-something peppy girl who sings the entire set in Japanese. Nerd-dom was in full effect too. The first guitarist announced that many of the songs are unreleased but that we could read the sheet music for them. Huzzah? Fighting for the mic between songs, the second guitarist stepped forth and let us know that, not only is the sheet music available for free at the back of the hill ("I know that sounds exciting but try not to rush the table "), but that we are encouraged to take it, grab our own instruments, and , before the album comes out, send Deerhoof our own recording of us doing their still unreleased song, to be somehow added to their effort. Last night’s Beth Orton show. This was part of the Prospect Park Celebrate Brooklyn $3 summer concert series. The show featured an enthusiastic singer, enthusiastic crowd, cheap tix, and open air well matched to the music style. Although I started non-committally , merely laying aside my bike to listen from across the road, I was lured in stages, first moving to lie beneath the pines in the cheater bleachers (where noone pays and the view is actually clearer than the lawn). After a couple songs of this, I paid, went inside and moved seat by seat to eventually the seventh row seats. Going alone makes it easy to come late and still sit close. Every song was radically unplugged and re-sung. Even when Beth Orton got to a standard like “Stolen Car” my recognition dawned only gradually. Coming from me, a casual fan, I think we all felt an I-got-my-money’s-worth sensation, what with the intimate between song patter, the special song renditions, and the frequent switching of instruments . The constant aw shucks patter between songs inspired a lot of sympathy. When she talks it's as if it's just you and a few friends sitting across from each other playing a game of cards. She noted that she is a small hall performer and was a little awed that anyone would think she could please a SRO amphitheater. “How are you people back there in the trees! I feel I’m not satisfying you.” . Out of the blue, she told an unrehearsed joke that she didn’t set up right so the punchline didn’t make sense. This mistold joke, plus all the talk about being a mom well-cemented the bond between her and the fans. The crowd was less female than I expected, although, to a man, the guys were all in tow of at least a woman if not a baby pram. In the entire sold out crowd, I saw no example of a guy there with other guys. It is apparently a losing proposition to convince a buddy to “meet me at the Beth Orton show”. The crowd’s style was surprisingly uncrunchy. This was a white wine Prospect Park demographic. Conspicuously absent, given the venue: Under-30s and African-Americans. Our universal disappointment in the impossibility of time travel certainly accounts for the appeal of watching film clips from crucial points in history. I'm especially keen on things that I missed during my childhood era. Seeing them now that I'm bigger is really satisfying finally, able to understand the secret world of those grown ups. It's like waiting 35 years for the other shoe to drop and it finally does. The word "Dylan" flew around with such import when I was a kid. It was spoken with gravity but completely eluded my understanding. 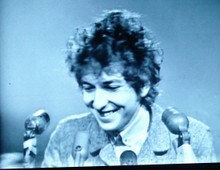 Today I rented Dylan Speaks, the 1965 press conference he gave in San Francisco and I saw some of the iceberg for which Bob Dylan was, to his bemusement, the tip, a clue of new-stirring mid 60's tidal motions. In the Q & A, Bob Dylan speaks plainly and unspectacularly, gently confirming that, if people want to make him a Johnny Bravo, they can do that, but he doesn't want to wear the suit, he just wants to make songs. He sits at a microphone and ashtray, facing a couple dozen people and an enormous KQED TV camera.His interviewers are mostly unhip cats, mostly not his peers. Everyone engages each other with more respect and less ridiculousness than I would have predicted. 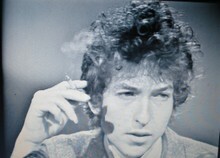 Bob shows up with a tweed suit, broach-not-a-tie, and a pack of Marlboros. For the first 20 minutes every answer he gives is a 5 word sentence. At most. He mumbles at the table, gives a little laugh, and fumbles for another cigarette. He's exactly as uncomfortable as I am in the center of an attentive circle. It opens up quite a bit after that. Watching this in 2007 we laugh as the men in suits look for the meaning. Are you trying to be the most famous man in the world? You really just want to be rich, right? They're' all attempts to analyze this folkie / youth culture thing, prodding him because it's easier than prodding 21 million young adults coast to coast. We would never care to do this now. We now know youth culture is no threat to anything whatsoever and is a harbinger of nothing at all,. really just a record label, a shoe style, and a face on a magazine. Nothing that the brylcreemed man running Exxon need take any note of.. 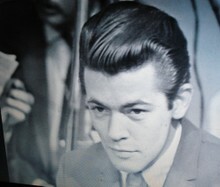 But who knew back in 1965. 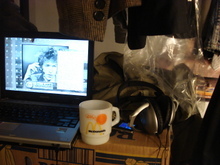 Watching the interview you could paint 5 or 6 completely different pictures of Dylan from his mix of serious and joking things he says. His statements are calm, patient, a bit bored, but pretty good taken as a whole piece of work. There's little worth quoting here but the whole thing can be consumed to great insight, the context and rhythm of the encounter bearing much of the message. I found it engrossing, all 50 minutes. It can be watched to great result if you seek the gestalt of 1965 America. "Mr. Dylan, I know you dislike labels. For those of us who are, uh, well over 30, could you label yourself and perhaps tell us what your role is." And my role is to just stay here as long as I can." I just consider them something from another time. It would be kind of dishonest for me to sing them now. “I don’t know. I really can't take it seriously. “Writing songs and performing them, that's what I do. Anything else, interferes with it. Trying to get on top of it and make something out of it that it isn't, it just brings me down. It makes it all seem very cheap.”. UPDATE: MICHIKO KAKUTANI writing in today's obituary of Norman Mailer observes that the 1960s were " a decade so surreal, so stupefying, so confounding, in the view of some, that it surpassed anything a novelist might plausibly imagine." As the lights came up, I got to chat for once with the person sitting in front of me. This was partly because she had sobbed all through the credits. In between sobs I could hear her saying “That’s why we insisted we buy him a phone”. Into the Wild was a very satisfying movie for me. In ticket price terms I would pay up to $60 to watch it. I was on the edge of my seat, heart beating for the first hour and a half. The sequencing of the real life events and the pacing of the editing made a good dramatic arc. Into the Wild gets down to business on his semi-suicidal Alaska bivouac in the first ten minutes of the movie. At which point I started to cry. I kind of cried several times in the movie. As travelogue, ITW sells the idea of the road strongly. Even North Dakota looks good. Kids will notice. The trickle of Supertramp pilgrims that had previously mimicked Alex’s travels will surely now be a flood. The power of this movie on youth should be at least as “corrupting” as Keruac’s was in the 50’s. 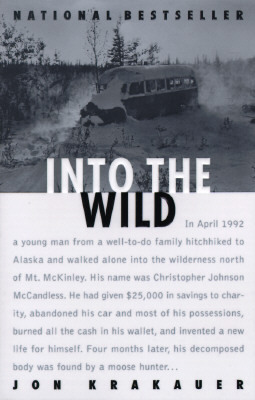 They made Chris McCandless a more sympathetic fellow in the movie than he was in the book. Sean Penn, unlike Jon Krakauer, makes Chris very likeable, though stops short of making him seem heroic or even smart. A) Filming it transforms Into the Wild into the cultural reference point that it couldn’t be as a book. No post-Twain book can become part of the culture at large, not in an age without readers or a country with as strong an anti-intellectual streak as the US. C) How did Penn get the parents’ permission to show the family from the sons point of view, including wife beating, adultery, and Dad keeping a second family on the side? As a teacher I have to say I’m hesitant to film adults based on the observations of kids. I watched this movie with a Manhattan audience of older people, most were 40 or 50. Some had read the book obviously by their reaction to onscreen depiction key visual images from the original story. The downtown audience had a serious disconnect with real life in the woods. A lot were shocked and disturbed by the hunting scenes, especially Alex’s tragic attempt to single-handedly dress a moose in a place that probably has more flies than anywhere in America. The guy behind me clucked his tongue, vocally upset when anti-materialist Alex burned a pile of paper money in the desert. At the end of the movie people charged out at the sight of the first credit. I was like, huh? For me, this was more a movie where you couldn't help but sit afterwards, stunned, contemplative, sad, or at least studying the extensive list of locations in the credits. Sidenote: Into the Wild was the first movie I saw where the credits has to extensively catalog the original Tolstoy and Thoreau sources.